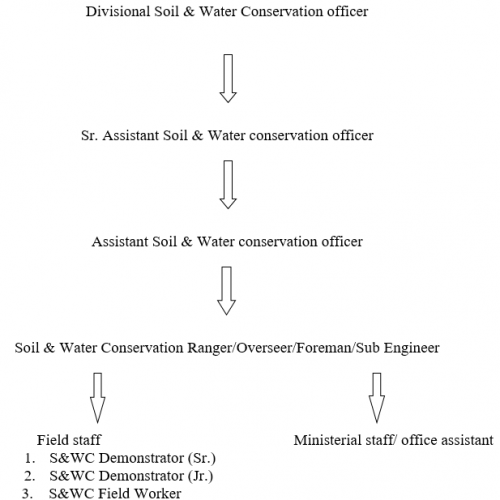 Department Address: Divisional Soil & Water Conservation Office, East Jaintia Hills District, Khliehriat, Opp. Power Grid, Deinchynrum. As one of the major development partners in the State, the Soil & Water Conservation Department is entrusted with the task of natural resources management in particular soil, water and vegetation resources. By adopting and applying appropriate soil and water conservation techniques and measures, perpetual utilization of the said resources can be achieved. These three basic life support systems when managed effectively will ultimately lead to sustainability and promote need-base, economic and ecological development. WDC-PMKSY Erstwhile Integrated Watershed Management Programme (IWMP): The Central and State Share for the Scheme is in the Ratio of 90:10. The main objectives of the IWMP are to preserve and conserve the ecology, restore and develop degraded natural resources by arresting soil loss, improving soil health, soil-moisture regime augmentation, promote water harvesting, recharging ground water, enhance crop production and promote livelihood and gainful employment opportunities. NABARD Loan – Soil & Water Conservation Scheme under RIDF: The Department started implementing Scheme under Rural Infrastructure Development Fund (RIDF) – NABARD Loan from the year 2000-2001 onwards. The basic objective of the Scheme is to enhance the productivity of agriculture its allied activities and in small river valleys, thereby improving the socio-economic set up of the people in the rural areas. Besides these, the scheme also envisages to promote sustainable development through conservation and management of Soil and Water. Har Khet Ko Pani erstwhile Accelerated Irrigation Benefits Programme (AIBP): This is a Central Assistance scheme sponsored by the Ministry of Water Resources. It is in the form of central grant (90% of the Project cost) and the balance cost of the project (10%) as the State’s share.The main thrust of the programme is to increase the area under irrigation thereby increasing the productivity of the area and improving the socio-economic condition of the people. National Bamboo Mission (NBM): The Mission envisages promoting holistic growth of bamboo sector by adopting area-based, regionally differentiated strategy and to increase the area under bamboo cultivation and marketing. Under the Mission, steps have been taken to increase the availability of quality planting material by supporting the setting up of new nurseries and strengthening of existing ones. To address forward integration, the Mission is taking steps to strengthen marketing of bamboo products, especially those of handicraft items. Springshed Development Works: The objective of the project is to revive impaired and critical springs to ensure enhanced water, food and livelihood security of vulnerable communities through scientific and participatory development of spring-sheds as a climate change adaptation strategy. Rooftop Rainwater Harvesting Structure in school: The school rooftop rainwater harvesting system seeks to provide a source of water for maintaining of kitchen garden, toilet flushing, cooking, washing hands and feet before eating and after toilet use, hygiene and finally, for drinking purpose – if the water is treated well. Afforestation Programme: It is a state sponsored scheme.